Looking For A Way To Save Money – Try Coupons! In today’s economy, we are all looking for ways to save money and stretch each and every dollar. One tried and true measure for saving money on your wants and needs is to use coupons. More and more shoppers are turning to the internet for coupons to use both online and off. Total Fusion Media is proud to announce that we are the official resellers of a new coupon website www.mywaycoupons.com! The website is fun and easy to use. It is free to consumers and very affordable for businesses to be listed! As a consumer you can print your coupon, have it sent to your cell phone, or just show your key tag card in the business to get their offer. This site is simply for coupons we do not spam you, sell, nor share your information. It is not a search engine optimization site, nor a social media site. MyWayCoupons.com was designed primarily for consumers. We make it easy for them to obtain local business coupons. 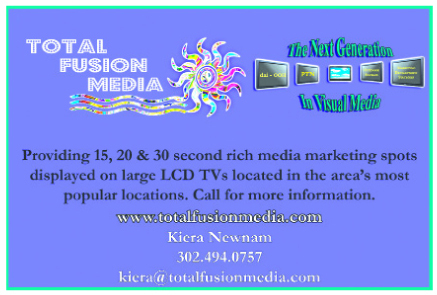 We are heavily marketing our site with Social Media and our Indoor Digital Billboards. We also attend local events where we hand out thousands of consumer member key tag cards. We are involved with several different organizations that drive people to our website for coupons. In addition, we sponsor events that are gaining us more exposure everyday! Fruit Flowers and many more!!! Visit the site to get your free coupon key tag card. Please contact Renee Goolday at 302-218-8871 to get your business listed on www.mywaycoupons.com. ← Previous Story What Should Parents Do When Mid-Year Report Cards Don’t Measure Up?